There is a big difference between photographing regular skateboarding and longboard skateboarding. 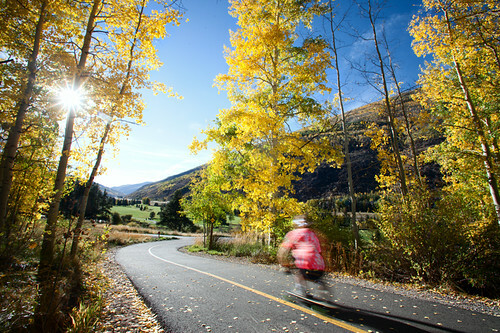 The athletes are mostly going downhill and sliding or cruising at some cool scenic spots. Since they are not flipping the board or flying off the ramp it looks like they are just standing on the board most of the time. Here are several tips for making your images more exciting. Location, location, location. Just like with every other photo you need a cool location to get great images. 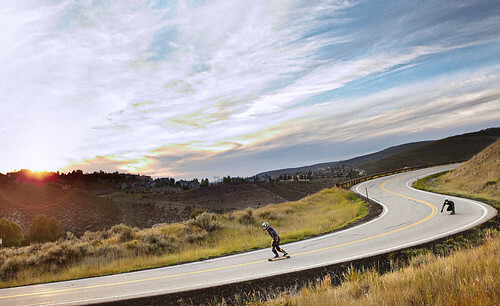 With longboarding this part is crucial. The whole image could be around the location or a poor location could destroy it. So choose a nice scenic spot with a good backdrop. Usually a hill side that overlooks a valley or a town will work really well. The Golden Hours. This tip is mostly true for shooting any action sport. Shooting early in the morning or late in the afternoon will give more pleasing light and all the textures will have more detail because of the lower angle of the sun. Don’t be lazy! Instead, get up really early and go get some amazing images. We are sure you will be pleased with the results. Speed. You may think that if the athlete is going slowly it is still going to look OK, but it won't. They have to go fast so you can tell they are actually leaning and you can “see” the G-forces working on them. In some cases you will get better face expressions, dust behind the boards and other “good stuff," that won't exist if they are going slowly! Brightly colored clothing. Since longboarding is a lot about location and vibe, talk to the athletes the day before the shoot and make sure they bring a bright colored t-shirt. If they are wearing brow or dark green they can easily blend in with the grass, trees, and everything else. Bright clothing will make them stand out much more against any backdrop. Flashes. 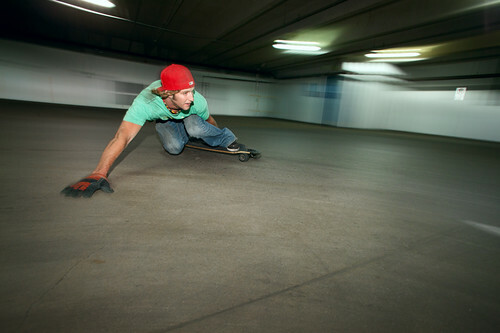 They are not a must for longboarding but just like with every other action shot, they can make all the difference. Make sure you place them low enough so you don’t get a shadowed face due to the athlete's visor or hat. Motion blur. This technique is used to convey motion, and that’s exactly what we need. Since some longboarding shots can look very stationary, motion blur will give you nice variety and a bit of a different look. Shooting from a moving vehicle with a slow shutter speed will give you a really nice sense of motion and a way different point of view. This technique is not easy, takes a lot of team work, and can be really dangerous for the athlete. So don’t try this at home! The formula (if there is one) for great longboarding shots involves: finding a cool location, getting your athletes properly dressed up, waking up early (or wait for the sunset) and experimenting with all the different techniques of motion blurring and panning.